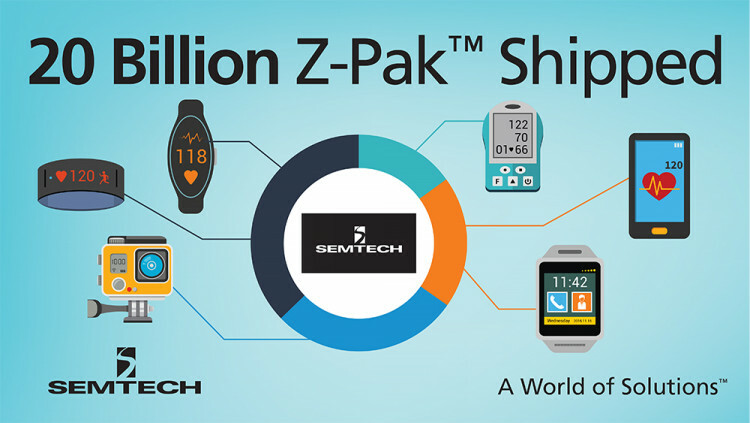 CAMARILLO, Calif., March 7, 2017 – Semtech Corporation (Nasdaq: SMTC), a leading supplier of analog and mixed-signal semiconductors, today announced the shipment of its 20 billionth Z-Pak™, a significant milestone for its Protection Products Group, which provides a range of high-performance transient voltage protection devices for some of the most innovative, next-generation electronics available. Semtech’s Z-Pak is a leading solution for transient voltage suppression (TVS) protection in portable and consumer electronics. This high-performance protection device is housed in an ultra-small 0201 (0603 metric) package, making it versatile for safeguarding portable and consumer electronics from dangerous electrostatic discharge (ESD) and transient voltage threats. The combination of industry-leading ESD protection technology in an ultra-small footprint provides designers the flexibility of implementing leading-edge transient voltage protection without sacrificing board space. Exceeding the industry ESD standard test (IEC61000-4-2 level 4) for both air and contact ESD discharges, the device consumes a fraction of the board space required by TVS components with similar protection performance. Semtech Protection Products Group provides leading-edge transient voltage protection solutions for high-performance electronic interfaces, such as smart phones, LCD TVs, set-top boxes, tablets, computers, notebooks, base stations, routers, automobiles, and industrial instruments. Increasing port count and high-performance interfaces in next-generation electronics expand the need for transient voltage protection. Its innovative packaging technology has enabled Semtech to offer protection solutions that have industry-leading levels for capacitance, integration, footprint size and surge ratings, while offering superior manufacturability compared to traditional wafer level chip scale packages. Learn more about Semtech’s protection products: www.semtech.com/circuit-protection. All statements contained herein that are not statements of historical fact, including statements that use the words “designed to,” or other similar words or expressions, that describe Semtech Corporation’s or its management’s future plans, objectives or goals are “forward-looking statements” and are made pursuant to the Safe-Harbor provisions of the Private Securities Litigation Reform Act of 1995, as amended. Such forward-looking statements involve known and unknown risks, uncertainties and other factors that could cause the actual results of Semtech Corporation to be materially different from the historical results and/or from any future results or outcomes expressed or implied by such forward-looking statements. Such factors are further addressed in Semtech Corporation’s annual and quarterly reports, and in other documents or reports, filed with the Securities and Exchange Commission (www.sec.gov) including, without limitation, information under the captions “Management's Discussion and Analysis of Financial Condition and Results of Operations” and “Risk Factors.” Semtech Corporation assumes no obligation to update any forward-looking statements in order to reflect events or circumstances that may arise after the date of this release, except as required by law. Semtech and the Semtech logo are registered trademarks or service marks, and Z-Pak is a trademark or service mark, of Semtech Corporation and/or its affiliates.